Hollywood Studios was the first major park we spent a full day at during the Orlando leg of our Disney Global Tour. With the highly-anticipated Star Wars: Galaxy’s Edge opening next year, along with a new Mickey-themed ride, we definitely felt like it was the calm before the storm for this little park. We could have arrived at 7:00am for an Extra Magic Hour, since we were staying on property. AJ had done a little research and figured that the wait times for the rides we wanted to do would still be super long anyway, so the extra hour probably wouldn’t have been worth it in our case. We got to the entrance at 7:58, just in time to get into the park before it opened to the masses. This park has very few rides compared to some of the other parks. By my count, there are currently six rides. That’s it. Three of those rides are in the recently-opened Toy Story Land. The number will obviously change again with the opening of the new Star Wars land next year. Mickey and Minnie’s Runaway Railway is also scheduled to open in 2019. AJ had planned out our fast passes well, so we never had to wait in line for very long. 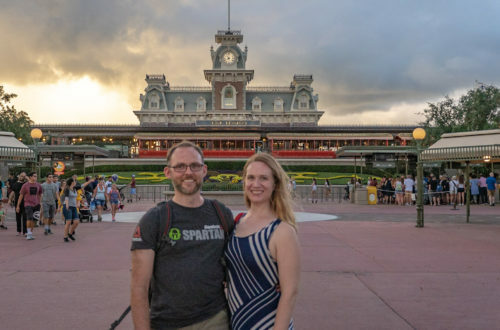 We wracked up a lot of steps zig-zagging across the park, changing locations based on our scheduled fast pass times and the various wait times for the rides. The only ride in Echo Lake is Star Tours, which will remain where it is, even after the opening of Galaxy’s Edge. We were able to do this ride twice, once at park opening when the line was short and again with our fast pass later in the day. For me, the coolest thing about the ride is that they have several different story lines, and you don’t know which one you’re going to get. In a way, they‘ve made one ride into many. If you get a storyline with Jar Jar Binks, don’t worry, you can ride again and hopefully he won’t be there. 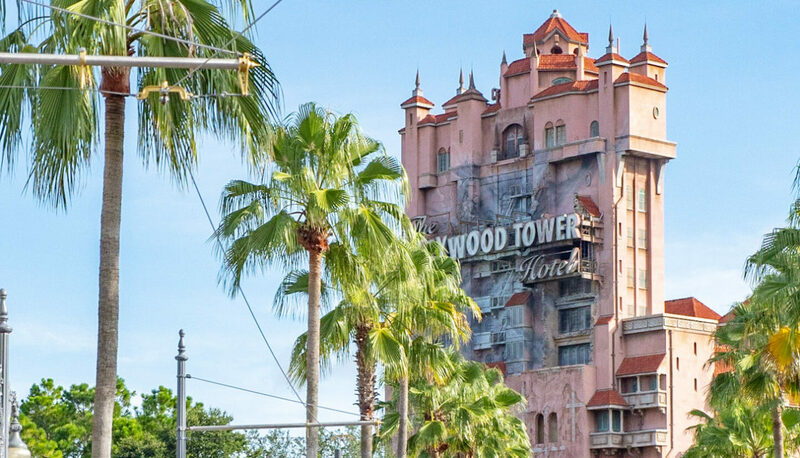 Sunset Boulevard is home to the two thrill rides at Hollywood Studios – Tower of Terror and Rock ‘n’ Roller Coaster Starring Aerosmith. Tower of Terror had been built up a lot in my mind. The reality wasn’t as thrilling as I thought it would be, but I still really enjoyed the ride. It was more gleeful than it was scary, I thought. I do appreciate that they’ve retained the Twilight Zone theme, especially since they recently re-themed the one in California to something more modern: Guardians of the Galaxy. Sometimes it’s fun to revisit the classics. I have an unfortunate association with Aerosmith. My roommate in my freshman year of college listened to Aerosmith exclusively. Every day. All year long. Although that was a long time ago, it still doesn’t take me very long to get sick of Aerosmith. Despite the music and the very cheesy intro to the ride, I thought Rock ‘n’ Roller Coaster was a lot of fun. I was surprised to find a ride at Disney that flips you upside down. Other coasters I’ve ridden at Disney parks are pretty tame in comparison. We rode that one twice – once with a pre-booked FastPass, and once with a FastPass we snagged later in the day. As I mentioned before, Toy Story Land has three rides. It also has lots of cute theming to go with them. If I have one criticism of the land, it’s that some of the queues are very exposed. On a hot and sunny day, of which there are a lot in Florida, it can get pretty unbearable. Everything is themed! I thought this was pretty cool. Slinky Dog Dash is the resident roller coaster. When we looked at it in pictures and videos of Toy Story Land, it didn’t look like it was going to be very fun. Fortunately, it was better than we had expected, a little longer than we thought, and more thrilling. It was actually the one ride that we would have liked to go on again but didn’t get a chance to. The FastPasses for this are snapped up very quickly, and the standby line is usually very long. Tip: try to sit in the back. It’ll be a little more exciting that way. Alien Swirling Saucers consists of several “saucers” sitting on two intersecting circular tracks. It whips you around one before switching you to the other one where the two intersect. It’s a good one for kids, and not bad for adults either, but kind of meh. Toy Story Mania! is almost identical to Midway Mania in California adventure and has a clone in Tokyo as well. It’s one of my favorites. You compete against the other three people in your car for the most points in a series of 3D midway games. Those who are extra competitive should be prepared for a sore arm at the end. The queue for the ride in Hollywood Studios is very well done and includes larger-than-life versions of many classic games and toys. There are ceilings made to look like board games – Monopoly, Chutes and Ladders, Candy Land. There are larger-than-life tinker toys, dominoes, and playing cards. The idea is that everyone waiting in the queue is a toy. I love it! The queue of Toy Story Mania! I know that I tend to be pretty critical of stage performances and singers especially. I try to keep an open mind and think about who the intended audience is for any given show. Even with that in mind, I thought the shows at Hollywood Studios ranged from underwhelming to dreadful. Especially after seeing how good the singers and shows were at some of the other parks, I’m totally baffled by what I saw at Hollywood Studios. With only six rides, you’d think they’d want the shows to be especially high-quality here. This show wasn’t bad, per se. The acting was pretty good and the stunt people were clearly very capable. I think that it’s hard to make a stunt look realistic without the benefit of film editing. Of course they need to perform all of the stunts safely, but watching safe stunts live isn’t that entertaining, in my opinion. The story of this show is cute, and I do love the Muppets. Unfortunately, there was something seriously wrong with the 3D aspect of the show. I don’t know if it needed to be calibrated or what. Whatever it was, it was pretty headache-inducing – exactly what I dread when going to 3D shows. It started out with some “Under the Sea” puppetry that was quite enjoyable, but it was all downhill from there. This show was not very well-thought-out or well-executed. The end of the 17-minute show was literally just a condensed version of the movie using a projection of scenes from the actual movie. They didn’t even bother to act it out. If you have a child who is a really big Little Mermaid fan, this might be worth seeing. But honestly, you’d be better off staying home and just watching the movie in its entirety. This was another very condensed stage version of the movie, and it didn’t work for me either. The story of Beauty and the Beast is already questionable. (Stockholm syndrome, anyone?) In this version, all it took was for the Beast to say gruffly “I… apologize,” and Belle fell head over heels in love with him. The actress playing Belle was very committed, and I have to give her credit for doing her absolute best to make that moment work. The choristers are good dancers who lip sync to a pre-recorded track. Unfortunately, some of them didn’t actually lip sync, which kind of ruins the illusion. (This was especially baffling to me after I saw performances in Tokyo later in our trip where Japanese and Western performers alike were very clearly lip syncing every single word – in Japanese!) There was also one chorus boy who was serving up a big smile and proverbial “jazz hands” while lip syncing “Kill the beast!” That… doesn’t really fit the scene. Unlike Fantasmic in California, there’s plenty of stadium seating at Hollywood Studios. There’s no need to buy a special meal package or anything in order to get a decent spot. I appreciated that. The show itself is pretty similar to California’s. It’s all about the light and dark sides of Mickey’s imagination. They use a lot of projections on water screens, accented by sometimes-blinding light effects. The music is mainly songs from the various Disney movies or pop-style songs about imagination. For me, the performers on the floats and the performer playing Mickey are the best part of this show. I imagine it must take an extraordinary amount of energy for them to exaggerate their movements the way they do for such a large venue. For me, the food was the best part of this park. We had two sit-down meals, each at a place with a really fun theme. Lunch was at the Sci-Fi Dine-In Theater, and dinner was at the 50’s Prime Time Café. Check out the links for restaurant reviews. Even though we didn’t eat there, we really appreciated the ABC Commissary as an air-conditioned place to rest for a few minutes in the afternoon. There really aren’t that many other indoor eateries that aren’t table service restaurants. The lot you parked in will probably be easy to remember, as they have signs posted everywhere. What we stupidly didn’t realize was that there are also row numbers painted on the ground at the end of each row. That would have been helpful. We were stuck at the end of the day, along with a lot of other people, using the key fob to make the car beep so we could find it. Oops. Especially if you follow tip #3 below, you don’t need a full day for this park, at least until Star Wars land opens. I would do all of the rides in the morning, eat somewhere fun for lunch, then leave and do something else in the afternoon. 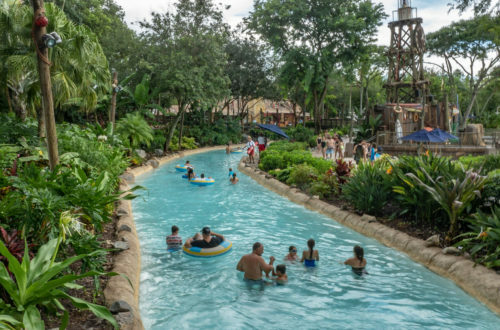 If you have a Park Hopper or Park Hopper Plus ticket, you can spend a few hours in another park or go to a water park. Or just relax at the hotel for a little while. You can always come back for Fantasmic in the evening. This is true for any Disney park, but is especially helpful if you only want to spend half a day at Hollywood Studios. 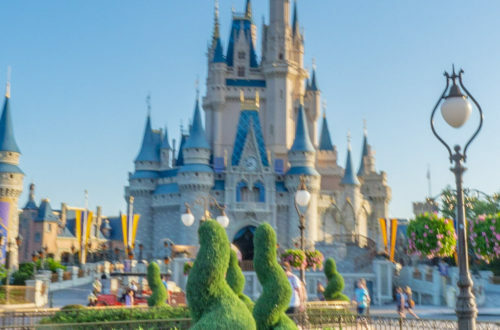 If you’re staying on property, take full advantage of your FastPass Plus reservations. The one to get first is Slinky Dog Dash. After that, we booked Rock ‘n’ Roller Coaster and Tower of Terror. Toy Story Mania FastPasses are likely to be available the day of your visit, so we didn’t pre-book that one. If you do end up waiting in a line for any length of time, the Disney Play app can help the time to go by more quickly. The games are specific to each queue, and you can play with the other people in your party. We had fun in the Alien Swirling Saucers queue making each other into Mr. Potato Heads. What are your tips for visiting Hollywood Studios?